We are from Hokkaido in Japan and it will be our 5th time participating the Honolulu Festival. 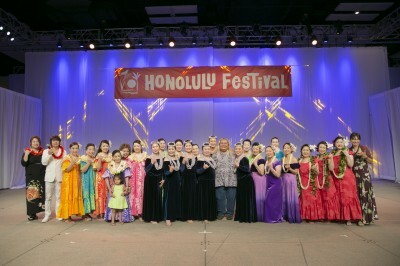 We unite with Hula dance, although dance members studio locations vary. We will be performing the Hula dance on chairs first time in 3 years please be sure to check us out! We have come from snowy Hokkaido to sunny Honolulu looking forward to performing hula at the Honolulu Festival! Our members usually practice at different locations, but we hope you can feel the sense of unity in our well-coordinated performance. We are from Hokkaido, Japan and this year will be our 3rd time. Our dancing members change every year in which we are always looking forward to perform on stage of the Honolulu Festival. Please expect a gorgeous performance by fusion of Hula teams from Hokkaido! People spend half a year living with snow in Hokkaido. That is why people from Hokkaido love the everlasting summer in Hawaii so much. Moreover, Hokkaido is said to have a great population of Hula dancers. This time, the Hula community of Hokkaido will become a single individual and go beyond the boundaries of Halau to dance with our true heart.